Anyways, this past weekend Brent and I headed to Nashville to hang out with some friends and just see the city. It just may be my favorite city I have ever been to. We had a SUPER early flight back to Boston and we were back home by 2. Which gave us just enough time to prepare for some people coming over for the Patriots game. While Brent headed to the game with them, I decided to make some pumpkin bread and sweet potato biscuits for breakfast the next morning. It was an easy way to have something for everyone to eat without making much of a fuss. 1. Preheat the oven to 350 degrees. In a mixer, whisk the pumpkin puree, canola oil, light brown sugar, water, eggs, and vanilla. 2. In a separate bowl, stir the flour, sugar, baking powder, pumpkin pie spice, and salt. 3. Add the dry mix to the wet and stir until well blended. Pour the batter into a greased bread pan. Bake for 60-70 minutes or until a tooth pick comes out clean. The bread is definitely not sweet and has a strong natural pumpkin flavor, which I love. 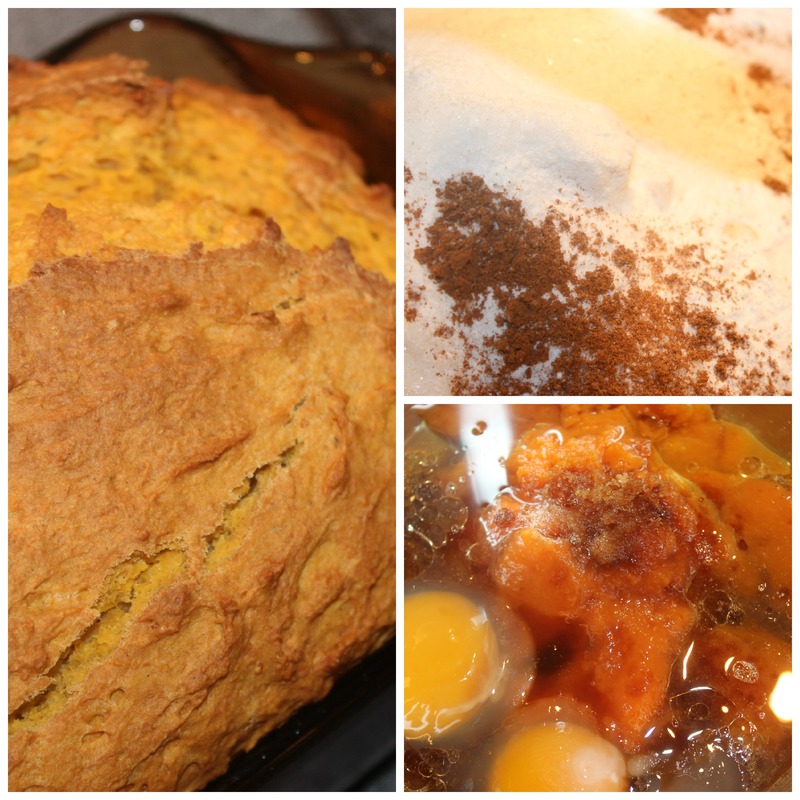 It allows the pumpkin puree to take over the bread, as opposed to sweetness and spices. It was delicious. 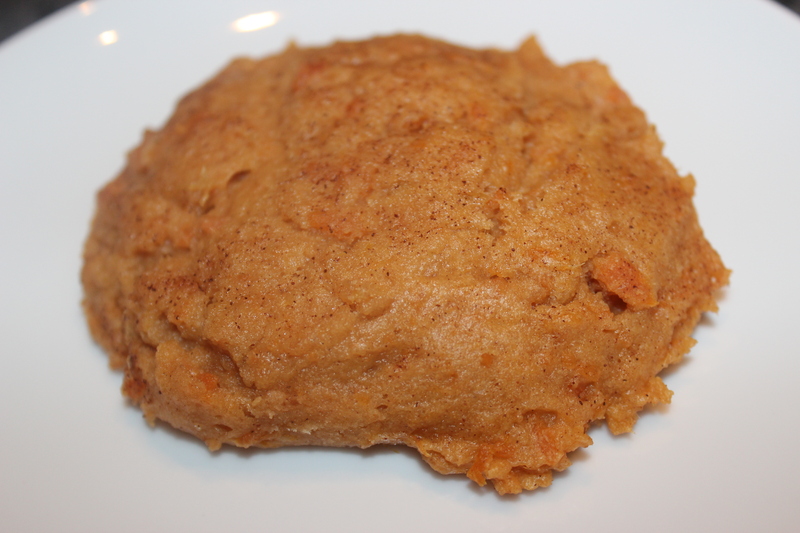 I also made, or attempted to make, sweet potato biscuits. I had gotten this cute mix in a mason jar from a wedding that Brent and I were in a little while ago. I think my definition of a large sweet potato was VERY different than their idea of large. Because my biscuits turned out to be more like a moist cake texture. I don’t think I have ever made anything quite like this before. It was definitely delicious and I can see how the biscuit version of this would be irresistible. This weekend I’m working on some fall inspired coffees that you can make at home. I love making “fancy” coffees on the weekend and have some ideas on pumpkin spice coffees. What do you make when you have several people over for breakfast?? The bread was definitely a win. It made breakfast super easy, especially when we all got up at 5AM for work! 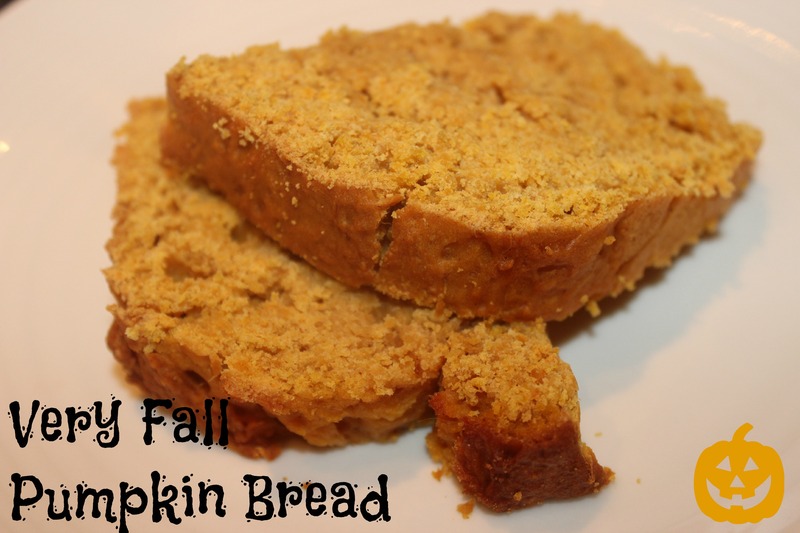 This entry was posted in Breakfast, Dessert!, Snacks and tagged Bread, Breakfast, Easy, Entertaining, Fall, Fast, Not Sweet, Pumpkin, pumpkin bread, pumpkin puree on October 10, 2014 by Sizzle Food. This past week was my parent’s Anniversary and I wanted to make something different for them. My father’s favorite ice cream flavor is Rum Raisin, and flowers just seem to be a staple for anniversaries. 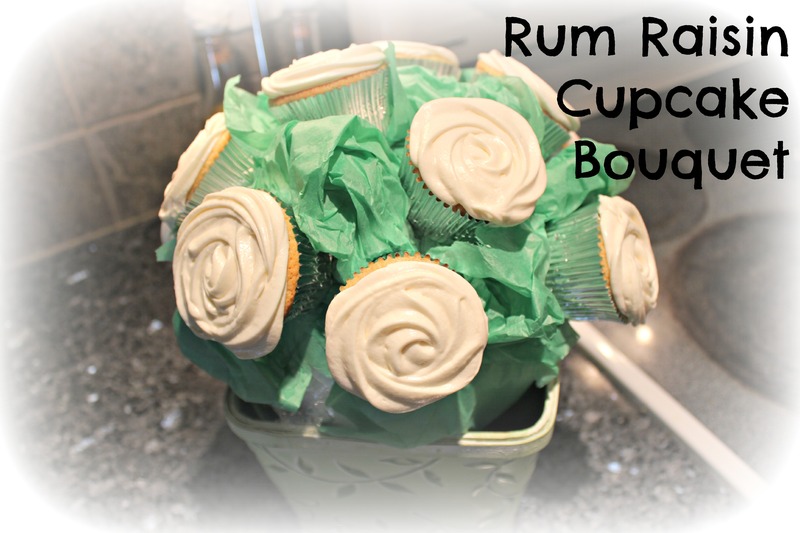 So, naturally I combined the two to come up with a Rum Raisin Cupcake Bouquet! Naturally! I did use Bobby Flay’s Recipe for this and it is a phenomenal recipe. This will be making an appearance at Thanksgiving for sure! 1. Bring rum and cane sugar to a boil in a medium saucepan. Once boiled, remove it from the heat and add in the raisins. Set aside for 4 hours or more. I started the cupcakes at this point. 2. Strain the raisins and finely chop them. Set the raisins aside for the cupcakes. Bring the strained rum to a boil in a small saucepan and reduce it to a 1/4 cup. Remove it from the heat and let it cool completely before you add it to the buttercream. 3. Combine the butter and cream cheese in a mixer at medium speed with a whisk attachment until it is light and fluffy. Add 3 cups of confectioners sugar and continues whipping. Then add in 3 more cups of the powdered sugar. Add the cooled, reduced rum mixture and rum extract. Continue adding the powdered sugar until you achieve the texture and flavor you desire. The thicker, the easier to pipe and mold. 1. Preheat the oven to 350 degrees. Whisk the flour, baking powder, baking soda, salt, 1 1/2 cups cane sugar, cinnamon, allspice, and nutmeg together. You can use a sifter to make the mix even lighter. In a separate bowl, whisk the melted butter (cooled slightly), buttermilk, oil, vanilla, rum extract, and yolks in a medium sized bowl. 2. In the mixer with a whisk attachment, beat the eggs until they they are light and fluffy. Add in 1/4 cup of cane sugar and beat again until stiff peaks form. Set the egg whites aside. 3. In a separate mixer bowl (or clean out the egg white bowl), add the flour mixture. Gradually add in the butter mix, while stirring at medium-low speed. 4. Using a spatula, fold in the egg white mix. You will notice a drastic change in texture. Then fold in the cooled raisins. Spoon them into cupcake tins with liners. Fill the cupcakes 3/4 full and bake for about 10 minutes or until a toothpick comes out clean. 5. Frost with the butter cream! They came out fantastic! There are definitely a few steps to make these, but it’s worth it! 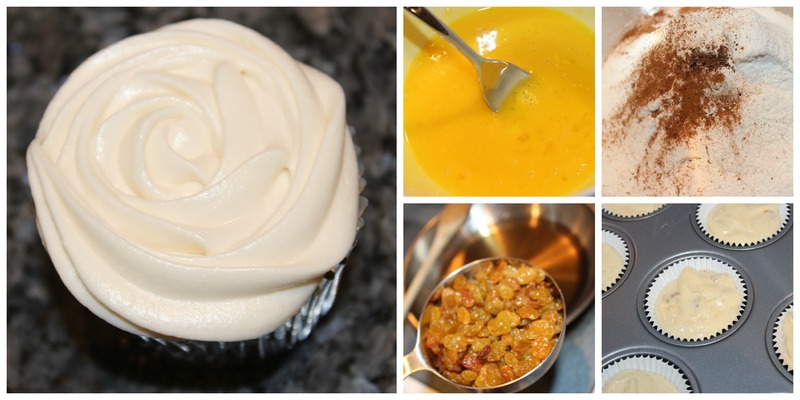 What is the craziest flavor of cupcake you have made? This entry was posted in Cupcakes, Dessert!, Random and tagged Bouquet, cupcake, Holiday, Rum Raisin on August 22, 2014 by Sizzle Food. So I guess I’m a little late when it comes to posting this but I’ve been debating whether or not I wanted to put it up. Well, I decided despite the lack luster pictures that I have, the ice cream cake was just too good to not post. 1. Mix the white cake mix and add the blue food coloring until the desired color is reached. I used the Cake Boss White Cake Mix and used about 15 drops of blue coloring. Bake the cake in a spring form pan and let it cool. Once cooled, remove the cake from the spring form pan and set aside. 2. Soften the raspberry sorbet a little and spread a layer on the bottom of the spring form. 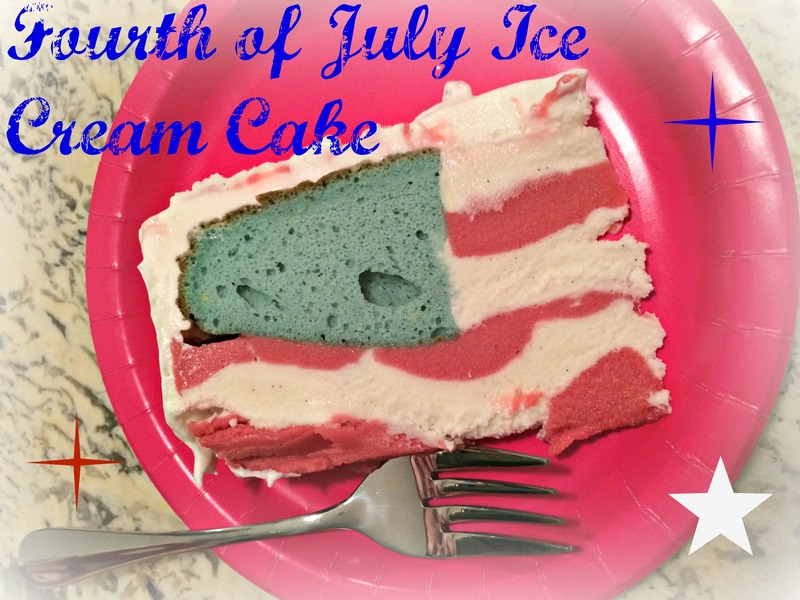 Make sure it is an even layer or else you will get a waving flag like the slice above. Cover it with plastic wrap, placing it directly on the sorbet. Freeze it for 30 minutes. 3. Soften the ice cream and add another layer on top of the sorbet. Cover it again with plastic wrap and freeze it for another 30 minutes. Repeat alternating ice cream and sorbet for 4 layers. 4. Cut out a circle in the center of the white cake and place the outer ring on top of the first 4 layers of ice cream. Continue alternating layer of ice cream and sorbet on the inside of the ring. 5. Once the top layer is complete. Remove the sides of the spring form pan and frost the cake using Cool Whip. You can either serve it right away or put it back into the freezer until you are ready. The combination of the sweet ice cream and the tart raspberry sorbet really made the cake. It was delicious and will definitely be making an appearance at another Fourth of July. Other than taking a little bit of time to put together because of all the freezing steps, it was relatively simple to make. What are some festive Fourth of July treats that will make it back next year for you? This entry was posted in Dessert! and tagged Cake, Cake Boss White Cake Mix, Easy, Festive, Flag cake, Fourth of July, Ice Cream, Independence Day, Raspberry Sorbet, Sorbet, white cake mix on July 11, 2014 by Sizzle Food. I love cupcakes and muffins that are just bursting with fruit, so I have a tendency to over do it a little when it comes to that. But that’s just me. 1. Mix together the topping. Set aside. 2. Preheat the oven to 375. Sift together the flour, baking soda, baking powder and salt. Then, in a mixer, beat together the butter and sugar until pale and fluffy. Add in the eggs 1 at a time, and then add in the vanilla. Reduce the speed to low and in 3 separate batches, add in the flour mixture while alternating with the sour cream. Lastly, fold in the blueberries. 3. Divide the batter among the cupcake cups. Sprinkle on the topping and bake for about 20 minutes, or until a toothpick comes out clean. 4. For the icing, beat together the butter and cream cheese until pale and fluffy. Reduce the speed to low and gradually add the vanilla and confectioner’s sugar. Raise the speed for 1 minute. Add the jam on top and immediately spoon it into the pastry bag. Do not stir it. When the cupcakes are completely cool, ice your cupcakes. You could easily just skip the icing and make these as muffins. The cake portion really isn’t that sweet and the topping adds a nice little sweet layer. Now for a giggle. 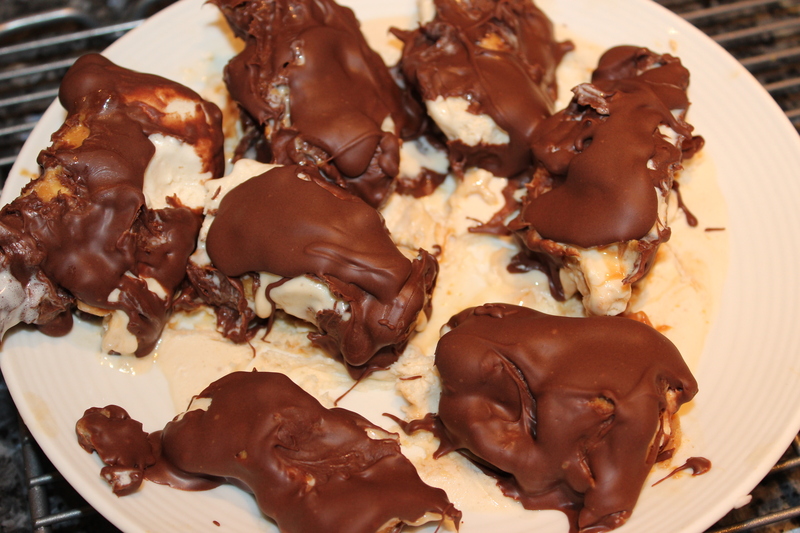 While I was making these cupcakes, my sister and I were trying to make homemade snickers ice cream bars. Great in theory. But execution wise, epic fail. 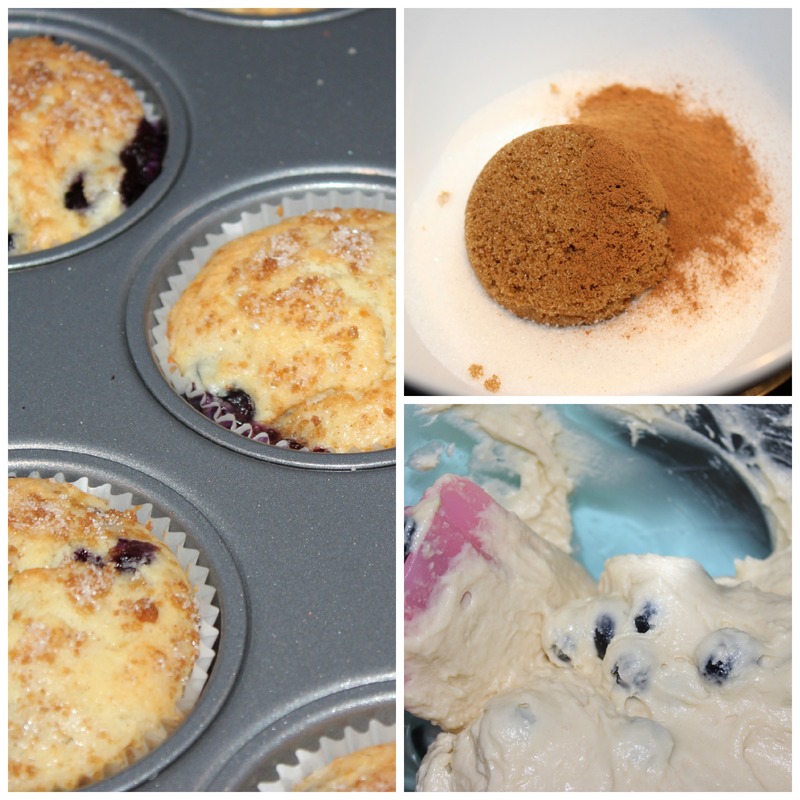 Check out the recipe here if you want to give them a try…or just look at what we were ATTEMPTING to create. 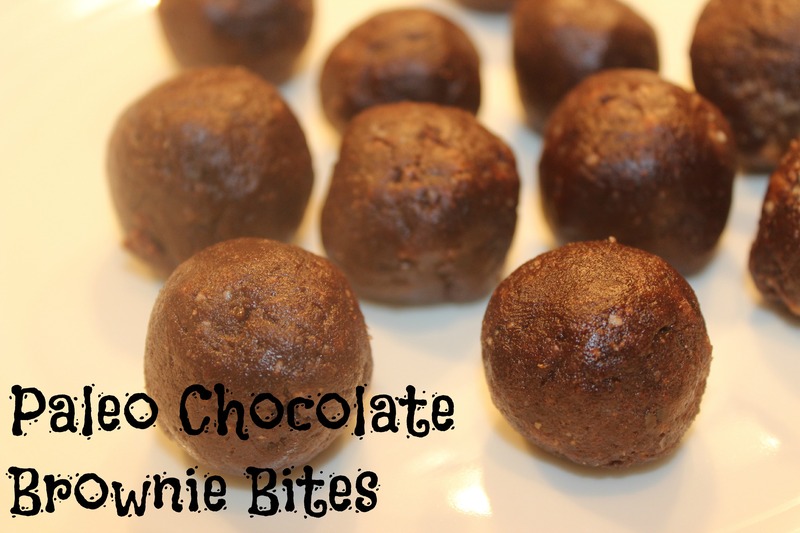 I have to say….they tasted GREAT, but they were exacting easy to eat. One day, we will try this guy again. This entry was posted in Cupcakes, Dessert! 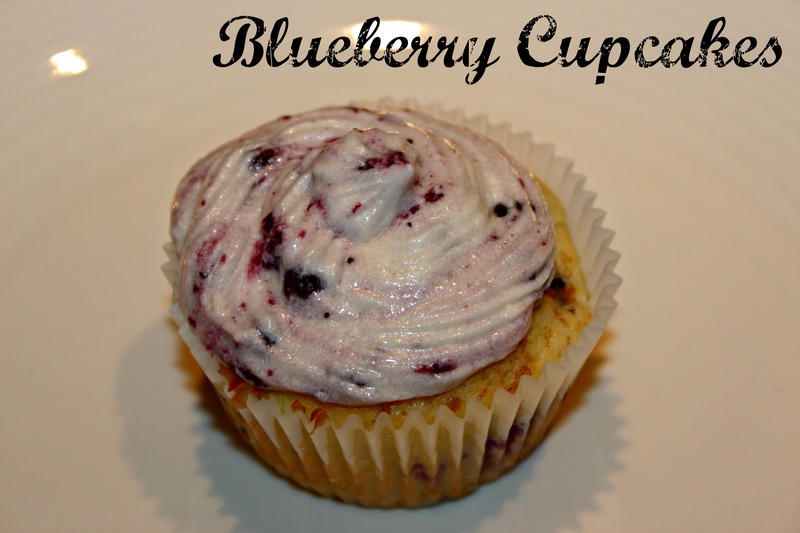 and tagged Blueberry, Cupakes, dessert, Father's Day, Fresh, Icing, Light on June 20, 2014 by Sizzle Food.